Sgt. Bilko fist saw the light of day in 1955 on the Phil Silvers Show. The show, a half hour situational comedy, ran for four seasons until 1959, but the affection that the audience had for the character continued through innumerable re-runs. Sgt. 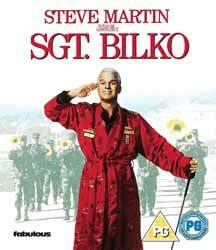 Bilko (1996. 1 hr, 30 min, 10 sec) is a comedy film, directed by Jonathan Lynn and draws on the characters and situation of the television show. Bilko (Steve Martin) is a sergeant in charge of the motor pool at Fort Baxter. His commander is Col. John T. Hall (Dan Aykroyd), a kind man if a little too trusting. Bilko spends his time working out rackets to make money, anything from running an illegal casino to a tug-of-war between a horse and Pvt. Duane Doberman (Eric Edwards). The story plays like an elongated version of one of the television episodes. Fort Baxter is supposed to be developing a revolutionary all terrain hover tank and has spent billions on the project. The tank has only a single flaw, it does not work. If the tank fires its main gun the shell goes one way while the tank shoots backwards. This is not so much of a problem until the army sends Maj. Colin Thorn (Phil Hartman) on an inspection tour. Col Hall is naturally concerned, but Bilko always has a scheme and believe that he can pull the wool over anybody’s eyes. Unfortunately for Bilko he has form with Thorn, a previous fixed fight which Bilko had bungled ended with Thorn being sent to Greenland. What follows is a slap-stick paint by numbers film which often relies too heavily on Martin's portrayal of a loveable scoundrel than it does a strong and funny script. The film throws in a love interest to pad out the timing, but spends most of the time on the cat and mouse game between Bilko and Thorn. The film has a good and talented cast; you can even catch an early role for Chris Rock as 1st Lt. Oster and it should have been a dream to see Martin and Aykroyd in a film together, but a strange thing happened to comedy around this time with the studios outputting films which were very uneven in terms of quality with some ending up as weak and not particularly funny, at least in the laugh out loud way. The film arrives with no extras and a very soft print, this looked poor even for a DVD release.